At least 153 people have been killed in Paris after multiple explosions and shootings at at least six different locations during a coordinated terror attack throughout the French capital, authorities said. Some 100 of those killed were hostages attacked Friday night at the Bataclan concert hall, police said, where a sold-out rock concert was underway. Police raided the theater just before 1 a.m. local time. As police closed in, the attackers set off suicide bomb belts, killing themselves. 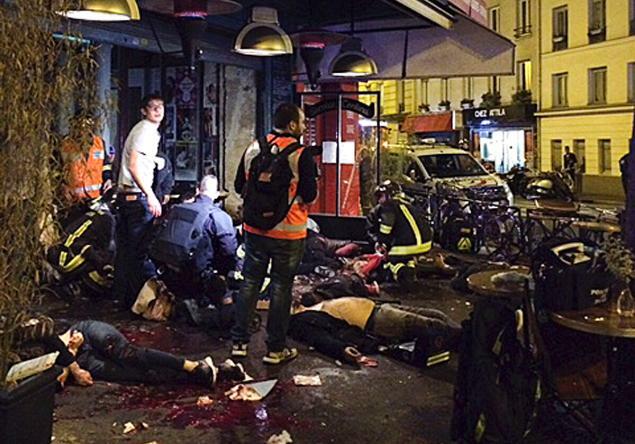 All attackers, at least four, are dead, Paris Prosecutor Francois Molins said. The dead gunmen were wearing explosive belts, authorities said. The terrorists shot up restaurants outside Bataclan before barging into the hall and beginning the bloodshed. More than 1,000 people were inside the hall at the time of the rampage, watching an Eagles of Death Metal show, authorities said. At least 112 people were killed there. Gunmen in the theater were killing hostages one by one and screams and gunfire could be heard from outside during the hostage situation, CNN reported. One Twitter user "begged" police to raid the hall and stop the bloodshed, according to the network. Explosives were also used on the hostages inside, officials said. Julien Pearce was able to escape and told CNN of 10 minutes of uninterrupted gunfire after the black-clothed terrorists stormed the theater, sending the crowd to the ground. He said one gunman was unmasked and was no older than 25. As he escaped, Pearce said he saw 20 to 25 dead bodies strewn across the floor. "We heard so many gunshots," he said of the carnage, which was carried out with Kalashnikovs. "They reloaded three or four times. They didn't shout anything ... Ten minutes of gunshots firing randomly in a small concert room. It was horrible." Anti-terrorist police flooded into the area, as did soldiers. Two people opened fire at the Le Carillon bar, while another shot up the Cambodge restaurant in the city’s 10th district, according to French media. 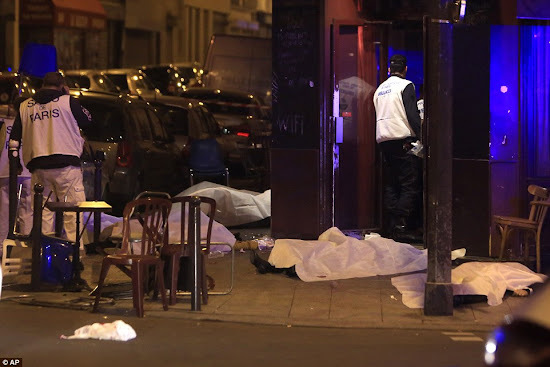 Kalashnikov-wielding gunmen attacked a Korean restaurant in the Bastille area of the city, while grenade blasts were also heard. It is thought that at least 11 died in the restaurant shootout, while gunfire was also heard in other bars around the French capital. Three explosions were heard near Stade de France, where France was hosting Germany in a soccer game. President Francois Hollande was there and was taken out by security to Place Beauvau, the interior ministry. There he met up with other senior politicians, including his Prime Minister Manuel Valls, for an emergency meeting. The explosions werr loud enough to hear inside the stadium, over the roaring of 75,000 fans, video of the match shows. At least two of the explosions were carried out by a suicide bomber and killed at least three people. The bodies were found near two of the stadium entrances and outside a McDonald's. During a midnight local time address to France, Hollande took the drastic step of closing the country's borders and declared a state of emergency, "which means certain places will be closed and travel may be banned." The state of emergency is the first declared in France since the 2005 riots across suburban housing estates as Hollande spoke of an unprecedented terrorist attack. 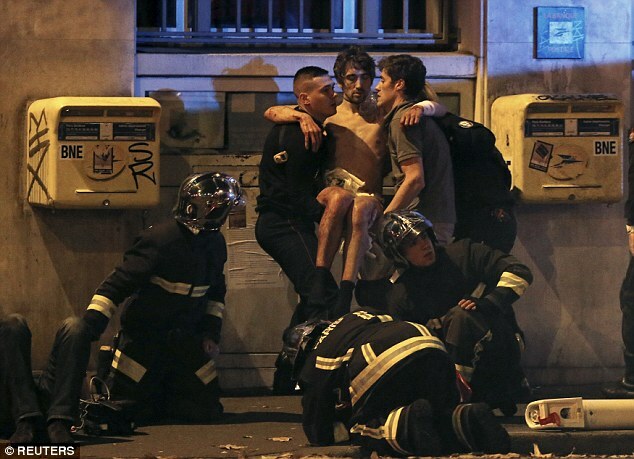 A general curfew was declared - the first time in France since World War II. Hollande canceled his trip to Turkey for the G20 summit. He also deployed an extra 1,500 soldiers to Paris. President Obama called the attacks an "outrageous attempt to terrorize innocent civilians" as he vowed to give France any support needed during a 5:45 p.m. address.